Plantation Shutters thrive on the latest trends and have a habit of remaining a step ahead, so when they needed to build a new exhibition stand, they put their heads together to create something completely unique. With their love for interacting with homeowners, designers and architects at the many expos held around South Africa every year, it’s always top of mind to find innovative ways to showcase their premium shutters, but it wasn’t until they met Herman and Clifford Hoffman of Container Rental and Sales that their dream became a reality. Under the guidance of Sam Lurie from Sprout Design, Plantation Shutters designed a trendy, funky and utterly gorgeous pod from a re-purposed utilitarian high-cube shipping container that’s 6m long, 2.4m wide and extra tall at 2.89m. 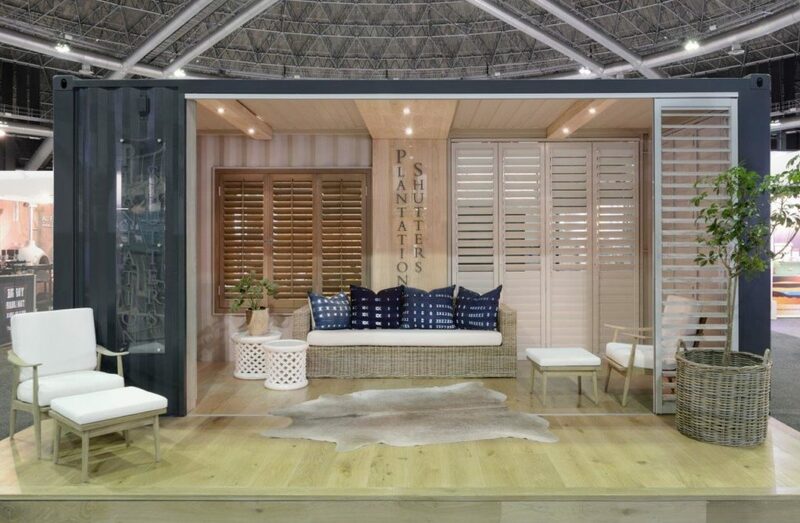 Plantation Shutters’ first exhibit at the Johannesburg HOMEMAKERS Expo in February incited a huge amount of interest from the public including one visitor wanting to buy the container “as it was” as a gin bar for his upmarket home. Be sure to visit their stand at the Cape Town HOMEMAKERS Expo from 30 August – 2 September 2018 at the CTICC. Whether you are painting your entire home or just one room, we have you covered with this year’s powerful colors and accessories to add. Cape Town HOMEMAKERS Expo invited two distinguished names in art, architecture and interior design to judge this year’s “for the love of CONCRETE Design and Art Competitions”. We chatted to Mardre Meyer and Marilyn Martin. Cape Town HOMEMAKERS Expo exhibitor, Aura Furniture Decor, tell us a little more about their unique range of products drawing inspiration from current Scandinavian trends to art deco and mid-century classics. See them, and other bespoke décor in the INTERIOR spaces feature area.